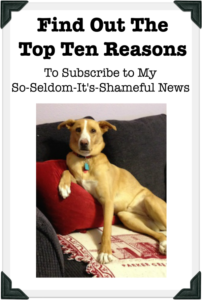 The only way to get all my news in one place is to subscribe to my So Seldom It’s Shameful newsletter. I try to get it out monthly, but you know how that goes. It will have complete updates about everything new and interesting in BeckyLand, but only when I have something new and interesting to say. If you want a more lively and interactive experience, then also sign up for “Becky’s Book Buddies,” my reader group on Facebook. In both places I’ll announce sales, giveaways, contests, introduce you to new authors (and their sales, giveaways, and contests), tell you what’s new in BeckyLand, post pictures of my adorable dog, Nala, and other stuff … but different things in different places. It’s up to you, however, to open and read my newsletter, so there’s that. (Every time I send out a newsletter I have a contest or giveaway of some kind. You’d be amazed at how many people enter, but don’t read the next issue to see if they’ve won.) The best way to make sure I don’t go into your spam folder is as soon as you subscribe and get the welcome email from me, add that address to your address book. Easy peasy. But if newsletters and Facebook aren’t for you, you can “Follow Becky Clark” and …. Wherever you connect, if you enjoy my books, I’d swoon if you left a review. Yes, swoon.